Andrea Ciceri and Mike Walker are excited. They are the first people to bring bitcoin accessibility to their North Bay home. 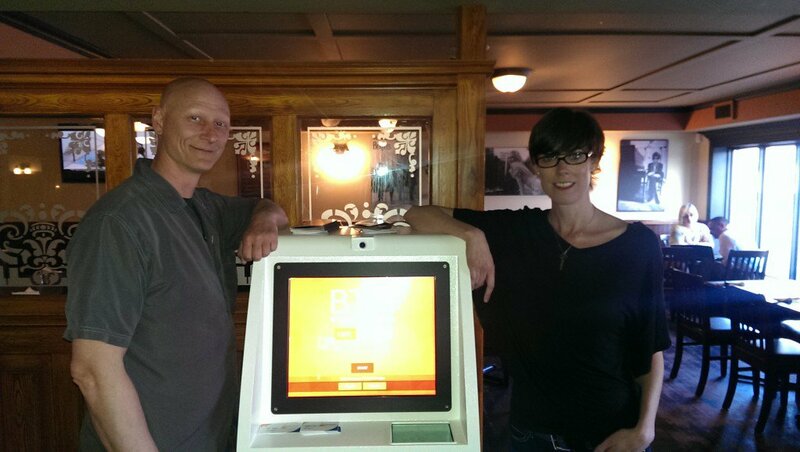 After months of preparation and planning, the founders of Crypto Kiosk enthusiastically unveiled their company’s first ATM – a machine made by fellow Canadian bitcoiners BitAccess – at their local pub, the Fox and Fiddle. People in North Bay are now able to learn about bitcoin, access it immediately and visit Mike as he shows off and educates on the machine. It is found at 112 Spencer Avenue in North Bay. While launches of Bitcoin ATM’s are no longer incredibly huge news, this installation marks at key turning point for Canadians. We are now finding them in almost every large city – and now, in smaller, more remote locations, too. This is exciting, as it is the first step into exploring the potential of the interconnectedness ATM’s can provide to the bitcoin network. We are using Canada to iron out any of the kinks that exist in the new technology, observe its workability, and help us determine the feasibility of bringing this specific infrastructure abroad to places where transferring money is a much harder task. India and Indonesia are two prime examples of places that could potentially benefit from an ATM infrastructure. Canada is a great place to start, especially in helping to encourage bitcoin education and adoption and, of course, smooth out any operational glitches that could potentially arise before launching the technology globally. Being able to touch, see and get real-time teaching on this new innovation is essential for people to feel safe and comfortable. Many complain that they can’t see or feel bitcoin; this allows them to normalize the process. Like many other Canadian ATM owners, Mike often sits by his machine, ready to help walk anyone through the process, and give a little Bitcoin 101 explanation. It is this kind of development that drives excitement and adoption. Andrea and Mike are planning to expand their business, with a clear aim of making bitcoin more accessible, and enabling consumers to buy and sell on demand. The frustrating part of entering the bitcoin market can be the wait times for exchange accounts; these accounts are harder to open than bank accounts and require a great deal of due diligence and Know-Your-Customer homework. An ATM, on the other hand, allows people to pay a premium to get in instantly. North Bay now joins Toronto, Ottawa, Montreal, Winnipeg, Vancouver and Saskatoon, amongst others, as places with Bitcoin-ATM accessibility. What’s next? After ironing out any possible kinks with the technology, places like India and Indonesia are natural next steps, allowing Canadian immigrants to quickly and inexpensively send money back to their families. And these two countries can likely support the kind of infrastructure needed to house an ATM. While it may be considered ‘old news’, this development is still very much ‘good news’ and what can develop from this step is still yet to be seen. Please visit www.crypto-kiosk.ca for more information on Andrea and Mike and their company.